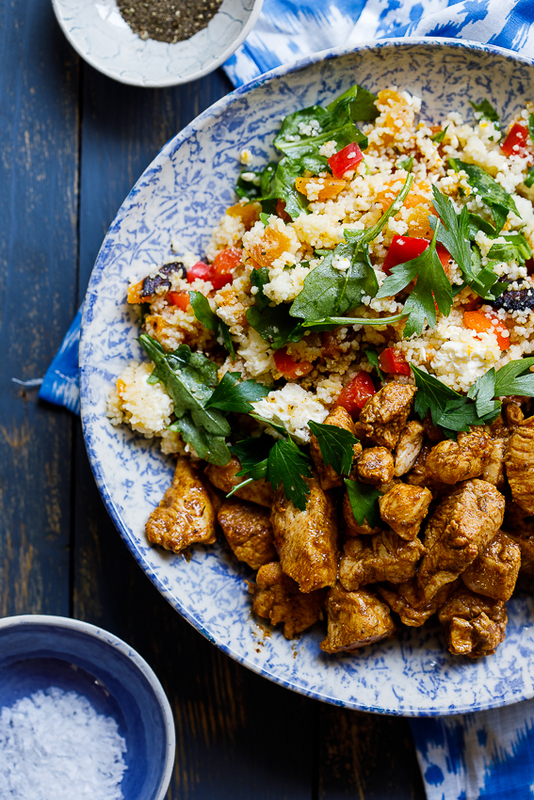 Meal prep made easy with this completely delicious Moroccan chicken couscous salad recipe. Make a big batch and feast all week long. 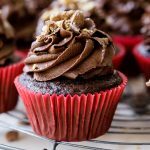 The internet is packed with ideas for meal plans and meal prep and getting yourself sorted and I have to be honest, it can sometimes feel a bit overwhelming to me. I know it’s a good idea and I know it will save me time later on but I get really flustered when I think about spending my Sunday cooking chicken and chopping vegetables and making brown rice in bulk. I mean, I really just want to lie in bed and watch Friends, you know? 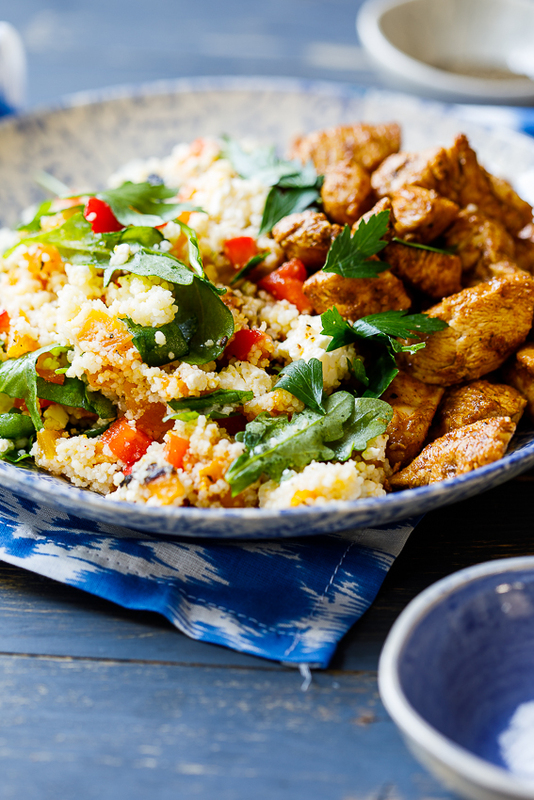 But that’s where this Moroccan chicken couscous salad come in to save the day because it is the most delicious easy lunch recipe. 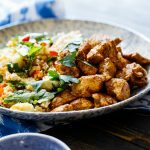 Not only does it not take more then 40 minutes to cook enough of this recipe to feed you for the entire week, it’s also my favourite, easy couscous recipe, ever. The couscous is studded with all kinds of goodness in the form of roasted butternut squash (but sweet potato and pumpkin can easily be subbed), red bell pepper, chopped dried apricots, feta and fresh rocket/arugula. So much flavour and texture! I’m not usually a fan of dried fruit in food but in this couscous salad it adds glorious texture and really great sharp sweetness. I love the peppery arugula and the creamy-salty feta just finishes the salad perfectly. The chicken is marinated in earthy, aromatic spices and quickly sauteed until just cooked, golden brown and juicy. Honestly, there are times I make the couscous salad by itself but the chicken does add a lot of flavour and is great if you want to add some protein to your meal. To add more meal prep variety, you can totally have the chicken on a green salad or in a wrap to keep things interesting. I’ve might or might not even eat it just as is, straight out of the fridge when lunch-time rolls around and I’m starving. It’s just SO good. Place the couscous in a large bowl then pour over the boiling hot stock. Cover with plastic wrap and allow to stand for 10-15 minutes. When the couscous is cooked, fluff with a fork then add all the remaining salad ingredients and mix well together. To make the chicken, combine all the ingredients in a bowl and mix well. Allow to marinate for at least 10 minutes and up to 24 hours. Cook the chicken in a hot frying pan until golden brown and cooked through. 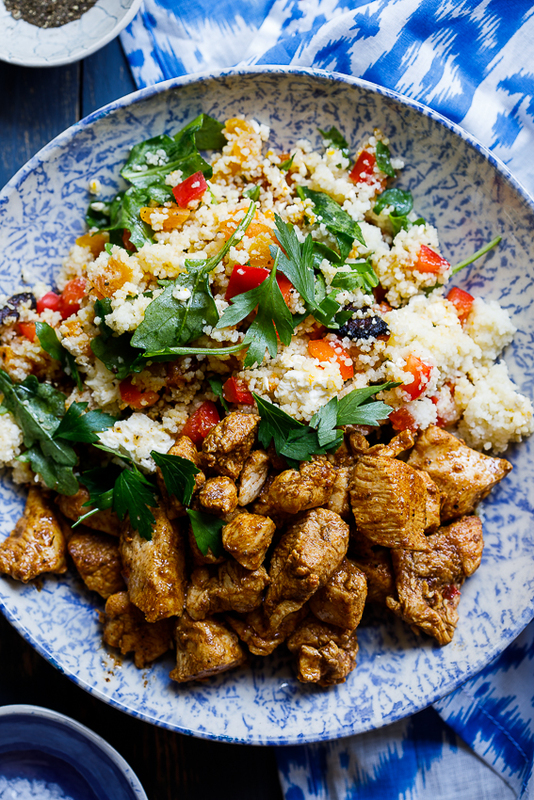 Serve the couscous salad with the Moroccan chicken. 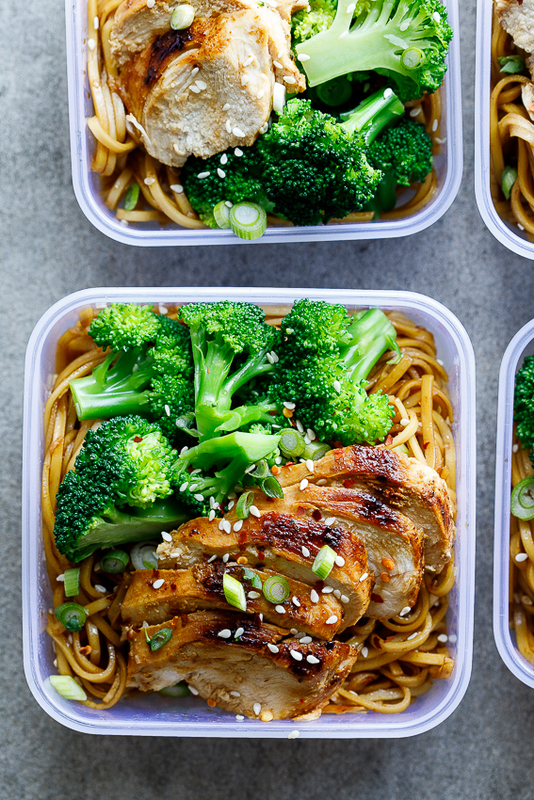 For meal prep: Divide the salad and chicken into sealable containers and store in the fridge for the week ahead. Absolutely delicious! Fresh and filling at the same time. 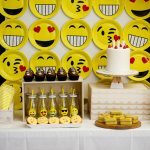 I’ll definitely make this many more times! I’m so glad to hear that you liked it Rebecca! I made the couscous salad and added fried mushrooms (I’m vegetarian) and it was so tasty. I made the full recipe quantity so I’m having it for lunch all week long. Ooooh I LOVE the idea of adding fried mushrooms! I made this yesterday and double the recipe to give us lunch all week long and it’s an instant hit. My husband loves it (he usually hates salads) so it’s definitely going into our meal rotation. Thanks for a great recipe. This is the kind of salad I’d enjoy for lunch or dinner Alida! Love those Moroccan spices and especially love the feta and apricots in the couscous. The feta and apricots make it!